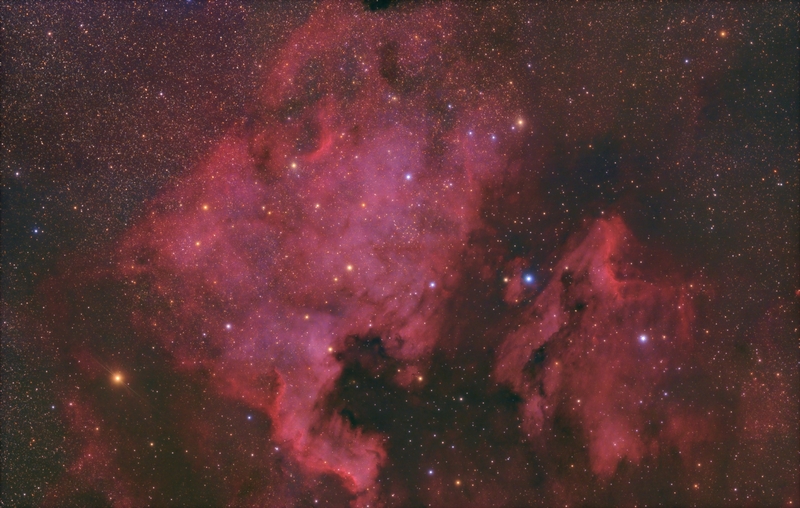 Several years ago I tried to shoot a mosaic of the North American Nebula manually using an old Meade telescope and CCD camera. After that frustrating effort I decided that mosaics were not for me! I've always wanted to get a highly detailed M31 image, but was never satisfied with wide field shots using a camera lens. These shots always seem to lose detail and I wanted a picture to blow up and hang on the wall. In the fall of 2017, using a SkyWatcher reflector and a Canon 60Da I tried for another manual M31 mosaic and after way too much work I managed to get the image below. The poor quality of the image is a result of the time it took to manually align the scope for each frame, this limited the time I had for each exposure and I wasn't able to finish the mosaic in the limited time I had. Starting in the winter of 2017 I started developing the software to automate the capture of mosaics. Mosaic Engine uses the ASCOM system to control a variety of mounts. It completely automates the mount control and using a PHD guider interface it automates control of the guiding system as well. With the help of a small hack, Mosaic Engine looks for a file in the data directory and uses it to synchronize with your camera control software. This allows completely automated mosaic acquisition and multi-target imaging. 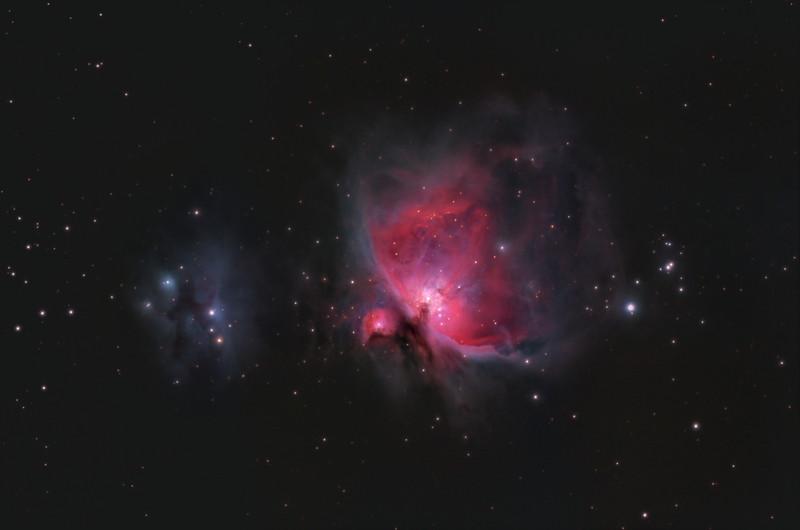 Mosaic Engine has been alpha tested with Back Yard EOS and Images Plus camera control. If you would like to beta test Mosaic Engine drop me a line at blair_AT_nightanddayastrophotography.com (fill in the @ symbol for the _AT_). Here are two mosaics taken during testing in the summer of 2018. Both are 3 by 3 frame shots assembled using Microsoft's Image Composition Editor from 30 minute stacks of five minute sub-exposures. Click on the image to visit a page on my website with more detail on the image. 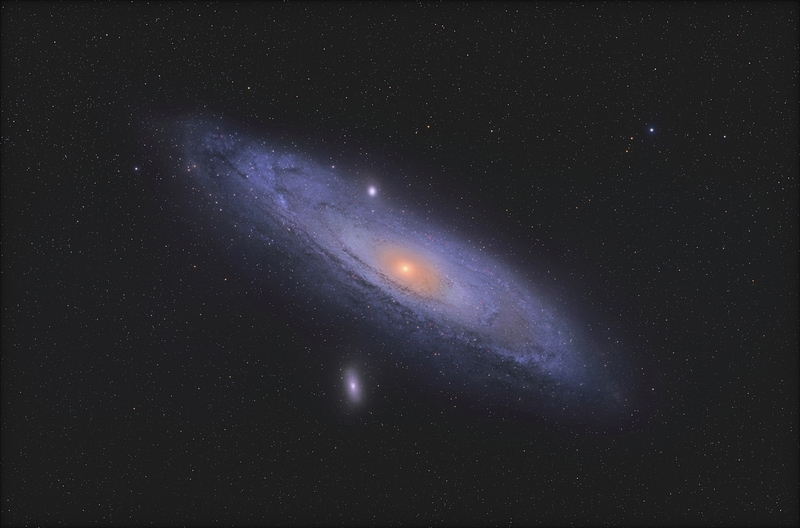 It has taken me a few years, but I finally have that Andromeda Galaxy shot hanging on my wall. This mosaic page is a work in progress and will be updated as I capture more images using Mosaic Engine. This is an urban shot of the 2018 close pass of Saturn to M22. This was shot from my driveway and shows just how large the objects we look at really are. Saturn, the bright yellow orb just above the center on the left was about 1.4 billion kilometers away while M22 is estimated to be 9785 lightyears away. That is 92,571,270,441,700,000 km away compared to 1,400,000,000 km for Saturn and it is still many times the apparent size of Saturn from our point of view! This is a 3 by 1 mosaic of a winter time favorite taken from an urban location. As with the other imges on this page, click on it to visit a page detailing the shot.